NASHVILLE, January 18, 2006 (LifeSiteNews.com) - Jim Caviezel, star of "The Passion of the Christ", is taking up the character of Jesus once again - this time in a dramatic audio production of the New Testament cast alongside many Hollywood stars like Michael York and Richard Dreyfuss. 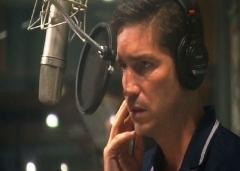 Thomas Nelson, Inc, the world’s largest publisher/seller of Bibles, announced Tuesday that Caviezel would reprise his role as Jesus with other Hollywood actors in The Word of Promise: New Testament Audio Bible, a 25-hour 20 CD audio project set for release in October 2007. The project was conceived by producer Carl Amari, CEO of Falcon Picture Group, who approached Caviezel to play the lead role of Jesus Christ after working together on the 2004 family film "Madison". Caviezel relished the chance to explore again the character of Jesus in this new medium and joined Amari as a co-producer of the project along with Catholic EWTN journalist Raymond Arroyo. Besides Caviezel, the cast boasts other Hollywood stars including Michael York (Narrator); Academy Award winner Richard Dreyfuss (Moses); Academy Award winner Marisa Tomei (Mary Magdalene); Golden Globe winner Stacy Keach (Paul); Terence Stamp (Voice of God); Kimberly Williams-Paisley (Mary, Mother of Jesus) and many others. The audio production features an original music score by Italian composer Stefano Mainetti (Abba Pater) and also features the musical talents of Grammy Award winner Michael W. Smith for a dramatic world class rendering of the New Testament. "The vocal and music talents, combined with the highest level production value, has resulted in a powerful presentation that will take listeners on an incredible journey through the story of the New Testament," said Wayne Hastings, Sr. Vice President and Group Publisher for the Bible Group at Thomas Nelson, Inc.
A follow-up to the New Testament is a 60-hour, 50-CD audio production of the Old Testament with Richard Dreyfuss, Michael York and Terence Stamp eager to reprise their respective roles.